If you are searching for Christmas gift baskets for men who are difficult to buy gifts for, your search is over. Whether it is a last minute gift you seek, something completely one of a kind, a special gift for him that can be delivered to a location far away, or you want a collection of gifts that will stretch your budget, ChristmasGifts.com has just the right solution this holiday season. Unlike those generic, mass produced gift baskets for men that you might come across in your local store, (you know the one’s we mean- they are overpriced, underfilled, and often include items he would rather toss away) the men’s gift baskets featured by our fascinating merchants include an abundance of items he will actually appreciate. These unique creations include a collection of items that are proven favorites for men year after year. Our unique merchants offer an impressive variety of Christmas gift baskets for men that are simply out of this world! Regardless of your special man’s interests, your budget, or your location, ChristmasGifts.com has got you covered this holiday season. Check out some of our favorite gift basket ideas! 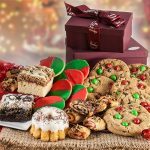 Christmas Gift Baskets: These hand filled gift baskets are created specifically with the Christmas holiday in mind, and they are overflowing with amazing treats he is certain to love. 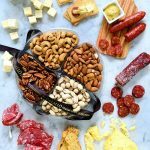 Choose from gourmet chocolate gift baskets, savory items like artisan cheese or meats, or salty varieties like pretzels and nuts. Wine and Cigar Christmas Gift Baskets: Does that man in your life take pleasure in the finer things in life? We’ve got just the unique Christmas gift baskets for him this Christmas. Choose from gifts baskets with fine wine, premium cigars, and hand crafted beer. If you have a few extra dollars and some extra time, be sure to check out our personalized pub glasses, custom wine glasses, or gourmet food gift baskets to enhance your gift. Monthly Gift Clubs: Let your man know you are thinking of him during the holidays and throughout the year with a monthly gift club! Monthly clubs are an excellent way to send Christmas gift baskets for him to receive as often as you like, and for as long as you like. Since a new selection is sent in every shipment, every single delivery is a surprise.